1400 start time on Sunday (April 20th) so arrive by 1330!! Public Transportation is highly recommended! By Public Transportation: Take Purple Line 5 to the southern end at Macheon Station. Leave Macheon Station --there is only one exit. Take a sharp left and walk into the narrow street (Bokjunga-Gil) going in eastern direction. Continue until you come to a bigger road. On your left you will see a Digital-LG store. Here you cross the street (Be careful!) and go left. You will walk on the right side of the road and look for driving MASHers willing to to give you a lift the remaining way. Approx 200m (.2km) from the LG store, turn right at a green sign showing "Children's Safety Park 450m." After 200m, cross a small intersection and continue toward the Children's Safety Park, which is approx 300m further on your left. Upon arrival, get ready to MASH! By Car: Locate Route 88 (Olympic Expressway) on the south side of the Han River. -Drive east (direction: Sports Complex) Signs also show "Gangil-IC"
-After passing the Olympic Stadium, move to the right lane and prepare to exit. -Continue to the end of the road where you will find the Oryun Junction. -At the Oryun Junction, turn right (direction: Gaerung Station). -Move to the left lane and prepare to turn left. -At the next intersection, turn left (direction: Macheon Station). -ZERO your odometer at the intersection! -After 1.6 km, see blue building (Police Station) on your left. -At 2.2km, turn left. On your right you will see a bus terminal. -Continue left and follow main road north. -At 2.9km, after passing a traffic light, you will see a Digital-LG store on your left. Look for walking MASHers on the right and offer life if you can. 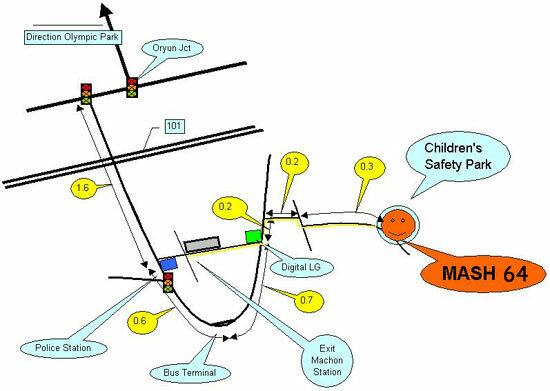 -After aprox 200m (.2km) from the LG store, turn right at a green sign showing "Children's Safety Park 450m"
-After 200m, cross a small intersection and continue toward the Children's Safety Park, which is approx 300m further on your left. Upon arrival, get ready to MASH! Call Bunny at 011 9950 2791 if you get lost. You can leave a bag and any post-hash goodies in a car while running. We're celebrating spring and Easter so wear something colorful! There will be Easter eggs and candy to find along the way and Easter t-shirts for the kids! There will be the usual drinks and snacks afterwards and everyone is encouraged to bring something to share. There will be a grill for the BBQ minded.